Commercial masonry repairs, restorations and rebuilds must be conducted with utmost attention to detail. The finished product must look great and be strong enough to withstand consistent wear and tear. The actual work needs to be conducted in a safe and professional manner, especially if customers and employees are on site while construction is ongoing. Turnbull Masonry has been providing Toronto with successful commercial masonry repairs for years. We understand the importance of quality repairs that match the original integrity and style of the structure, hence why we excel at historic restorations. Using the right tools, tactics and precautions helps us ensure historic buildings are preserved to maintain their value and charm. We have just as much skill and experience when it comes to fixing newer masonry as well. If your place of work is made out of bricks, stone or any other form of masonry, at some point in time you’ll need to give us a call. No structure is built to last forever without showing signs of wear and tear, especially commercial masonry. By keeping up with regular maintenance you greatly increase masonry lifespan, while decreasing the risk for more serious issues and costly repairs. Regardless if we are repairing masonry at a school full of kids or an empty strip mall, we always maintain the highest level of professionalism. It’s part of our job to help your business maintain its reputation whenever we are on site working. Historic renovations must be conducted with a keen eye for detail and strong knowledge of preservation techniques. The City of Toronto views preservation of historic resources of high importance. As a result, there are many guidelines regarding best masonry practices for preserving historical buildings. For instance, replacement mortar must be appropriately matched to the original material in terms of color, appearance and strength. Unfortunately, poor masonry work negatively impacts historic buildings every day. This fact makes us cringe, as we take great pride in properly restoring historic properties and saving treasured pieces of the past for future generations to enjoy. We vow to treat every historic building as if it’s a Picasso painting in need of repairs. Our goal is always the same when working with historic renovations: to take nothing away from the value or history of a property, while adding many more years to masonry life. We have conducted many church restorations over the years, giving us ample experience for this specialized task. Let us take care of all your masonry needs. From brick chimneys to stone walls we know the tricks of the trade to make just about anything look and function like new. Your community counts on your place of worship to be there when they need it most, allow us to ensure the walls of the establishment stand up to that role. Schools are another one of our specialties with it comes to commercial masonry. We work with you and your budget to find the best solution to any masonry issues a building is facing. Something as simple as ignored moisture damage could lead to structural failure or mold growth. Allow us to stop the damage before it gets bad enough to injure a student or make everyone sick. We can remove and replace old bricks, repoint walls in need, remove and replace sidewalks, and so much more! Billions of people flock to strip malls every single day, meaning malls get a lot of wear and tear. The more wear and tear masonry receives, the more frequently it will require repairs. 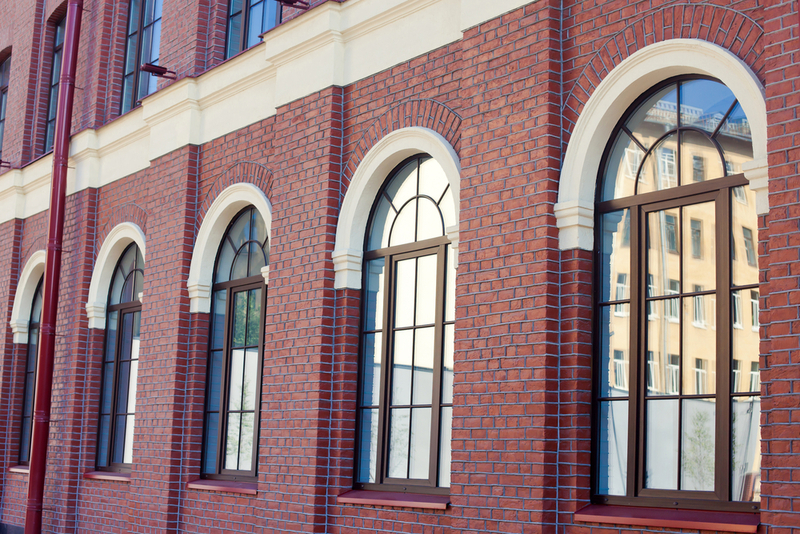 We offer strip mall restorations ranging from small repointing jobs to removing and replacing thousands of bricks. No job is too big or too small; we take care of it all. We stop at nothing to satisfy our clients and give them peace of mind. For instance, we offer a unique warranty system that covers clients for both restorations and rebuilds. Our family owned and operated business runs on sound morals and fair practices. We assess your needs and always take your budget into consideration in order to provide the best solution at a price you can afford. Our commercial masonry services extend above and beyond the competition. Contact us today to learn more!